In general to back up our phone contacts/or to import our contact from one device to another device we generally use “VCARD” feature. By using this feature we can back up our phones contacts. vCards(.vcf files) are very important part of our life because we all are using some kind of mobiles, smart cellphones, PDA devices, iPhones, Tabbing Devices plus our online email accounts In general after Vcard conversion all contacts are converted into individual (vcf) files .If we want import over 200 contacts from Outlook/Exchange/mobile vcard into Google Contacts, with their photos we can convert multiple .vcf files into single vcf files by using COMMAND prompt.Now a days so many mobiles having vcard as inbuilt feature. I have made this post because I have a bulk of vCards (288 to be precise) that I transferred from my phone (via Bluetooth) to my computer. Now I want to bulk import them into my Google Contacts but. multi-select feature on the import section. To make matters worse, the vCards are named sequentially, not by the contact name so it's hard to pick and choose what I want imported. So i have found one solution to combine all vCards(.vcf files) into one Single vCard(.vcf file) file. Step 2. Open Windows command prompt (Windows + R),and then type “CMD” to open command prompt and navigate to the destination folder where all your contact files are stored (you can type CD YOUR PATH command to reach to your destination). Step 4. Now you will get all your .vcf files merged into single .vcf file, just Import the created single .vcf file whenever required. This single vCard file will also work on your Google account. AWESOME MUCH!!!!!!! THANKS A LOT WORKED LIKE A CHARM!!!!! Google sayz no contacts found in the all.vcf file!! I tried with both vcard 3.0 and 2.1!! still not working help please!! then enter command : copy *.vcf all.vcf !!! then a single vcf file formed !!! 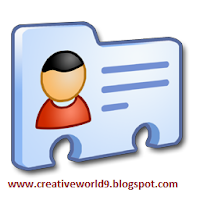 I have one vCard file [include all mobile contacts],how I can print all them in one page[not one by one!]? YA !!! you can take print out !!! Then it seems like this !!!! you take print out directly !!!! then replace all the remaining words like using replace feature like version ,end then itzz clear to see!!! Thanks... Awesome tips. Works like a charm..
than "Q" so much friend !!! i have only the all.vcf file can i convert all.vcf to all the vcf contacts? How many possible fields are there in vcard 2.1 and 3.0 versions? Can you please list all of them with and without example data in a text file? FYI, you can very easily import/export *.csv/*.vcf files to/from *.csv/*.vcf files in Windows Live Mail program (latest 2011). And *.csv files can be saved as *.xls or *.xlsx files in Excel 2007/2010 program. thank "Q" guys !! thanks allot for ur support !!! I love u for this ..
Wow! Great tip! Tnx a lot man! Just couldn't go away before droping in a line of Thanks. Good and a simple one. I ha more than 650 contacts and though copying all separately on the phone and then syncing with could have been done, this little workaround is way more better. I was actually unsure about the Version compatibility. coz the individual vcf were of Version 2.1 and i had seen Multiple contact in a single vcf in Version 3.0. I was unsure whether concatenating all in a single file would do the job but when i saw this small little command to concatenate all individuals in one, just thought to give it a try and it did work without any problem. Thanks for sharing. It works like a charm! You can also get contacts from Symbian S60 or Symbian^3 making a backup in NBU format with PC Suite (OVI Suite) and then extracting them with NBU Explorer. ALL VCF FILES ARE MERGED INTO ONE SINGLE VCF FILE SUCCESSFULLY. BUT WHEN I TRIED TO IMPORT THE 'ALL.VCF' FILE INTO ADDRESS BOOK, IT IMPORTED THE VERY FIRST ONE CONTACT AND REST ARE NOT IMPORTED TO OUTLOOK...! ! SO WHAT'S THE SOLUTION OF GETTING ALL THE CONTACTS INTO ADDRESS BOOK AT A TIME ? ? thanks a ton!! this was of great help!! This was really really useful bro. Thanks a lot!!!! hi thanks a ton but when i import it i get only my first one vcf contact, also how can we check it one by one & confirm it imports differently. One day of trying , until this lucky hit. nice. That's about windows users and for linux users try cat *.vcf > all_contacts.vcf ! But what if your contacts are saved as .contact not .vcf? thank you kind sir/mam for saving me hours and hours of pain and greif. I tip my top hat to you. behave differently! Need to follow exactly as mentioned by the Guru ! cat *.vcf > all_contacts.vcf ! its not possible though we can not merge one format to other.i.e.., (.contact) cannot merged to (.vcf). THANK YOU SO MUCH..all the guys…Thanks for your Amazing Response.. Thanks very much. I have no idea how to import this back into outlook on a different computer. it only imports one contact, the fist in the list. Help? You saved my life!! Thanks a lot !!!! Its really a very useful post. Worked like a charm! I am very grateful! This is great but when I import the .vcf file into iphone it brings in a lot of text in the notes which comments on which fields are empty - is there a way to avoid importing all this note text? wow wow wow..have gplus or fblike button on ur blog dude..i wanted to share it badly but cant find one! all VCF FILES ARE MERGED INTO ONE SINGLE VCF FILE SUCCESSFULLY. BUT WHEN I TRIED TO IMPORT THE 'ALL.VCF' FILE INTO ADDRESS BOOK, IT IMPORTED THE VERY Last ONE CONTACT Name with all numbers in Last Record Name..!!! Cheers so easy, so simple! THANKS A LOT, YOU REALLY HELP ME!!!! Make sure each single .vcf file has new line at the end, after END:VCARD. Great - easy to use and exactly what i was looking for - thank very much! i am using windows 7 home premium and following the exact way. pleas help me out it would b really appreciated. This is amazing, I use it for marketing sms to customers. ps make it into a batch file. pps, everyone here will also love "wondershare mobilego for android". So simple and effective. Thanks! simple and perfect.Appricate your infoshare.Easily trf contacts by sending single vcf file as attachment via email and downloaded it to my iphone.Thanks for a gr8 useful tip. Works great. I just emailed the merged vcf file to myself and clicked on the attachment in mail on the iphone. BTW, if you ever come across an e-mail with link to msnbc telling you the hottest job, don't click on the link. it sent out spams to your contact. It was why i had to delete my contact. That was a time saver...Amazing......bit tricky at first understanding where to put the vcf files (it was better for me on D:, because it was a direct link, rather than C: because it then had to go through documents and settings, etc.....couldn't get it to work. Mr. AARYAN ADITYA, you won't appreciate the time and effort you have just saved me. How could i have transferred nearly 2000 vcard contacts one by one??? i cant find the merged file....where do i look? the easiest way ever to combine all vcards into one csv file and successfully uploaded to Gmail and then to my mobile. you are AWESOMMMEE.. :)thanx a lot bro.. Simple. Clear. Effective. Easy. Thanks! Thanks! Was afraid there wasn't a way, but this worked in the first attempt! Great, thanks so much for your help! THANKS MATE! THE MOST USEFUL PIECE OF INFO ON THE INTERNET FOR ME SO FAR! SAVED ME 3 DAYS.. I like this way, I tried several things, but this one is better. People like you are life savers...thank you very much. hats off boss .... best way :) :) :) Thanks alot !! All File is Created but Its not uploading in Google :/ what can I do now? If i have same vcard entries in different files...does it merge duplicate contacts into a single contact in the final file? thank you so much!!! it was driving me crazy untill i found this pic of the commends. You can get the loan of up to Rs.400000 with none guarantee from identified person. If you're applying for the number of upper then Rs.4 lakhs, up to Rs.7.5 lakhs some one must provide the guarantee to induce the education loans. If you wish to induce the loan beyond Rs.7.5 lakhs, you have got to submit your property or something because the security to the bank. this can be same for finding out in Asian country and abroad.. If you can get any kind of suggestion on education loan then you can search on way2college. Thanks for sharing a nice information. AHHHH YESSSSS thank you so much great tutorial. Not only did I get all my contacts imported, I felt like a boss using the command prompt. I had an old Samsung Memoir feature-phone, with contacts backed up on it, not on the SIM card. I wanted to transfer to an iPhone 4S. The SIM card on the Memoir is regular size, and the iPhone is Nano, so I couldn't just transfer the contacts through SIM importing. So, I sent the files to my computer via Bluetooth Send/Receive from Phone to Computer. Took the .vcf files and combined them as stated in this tutorial, then sent the file to my email, opened it 'in Contacts' and then I uploaded the contacts, woohoo thanks for the quick way to merge multiple .vcf files into one .vcf. All contacts are now on the iPhone. Animation is one of the best and the popular course which is growing very fast day by day. There are many colleges that offers animation courses with best coaching. One need to be very creative in sketches and to do hard work to make a successful career in animation.